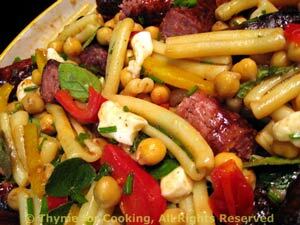 Salad of Pasta, Sausage, Chickpeas, Thyme for Cooking healthy salad. Chickpeas and Feta add a Mediterranean touch to this salad. You could as easily use grilled chicken breasts, or leave the meat out altogether for a vegetarian version. Heat oil, vinegar and soy sauce in skillet. Add pepper, sauté 5 minutes. Add chickpeas, tomatoes, and heat through. Set aside. Cook sausages on barbecue grill or sauté in nonstick skillet, before doing peppers, etc., on stove until done. Remove sausages and slice into 1 1/2" (4cm) lengths. Put all ingredients in small bowl and whisk well to combine. Put drained pasta in large salad bowl. Add vegetables and vinaigrette, and toss well to combine. Add sausage to pasta along with feta and herbs. Toss gently and serve.